Looking for Hearing Aids ? A hearing aid is a small electronic device that amplifies sound and is worn in or behind the ear to compensate for impaired hearing. It is used to help hard-of-hearing people hear sounds better. In the past, a funnel-like amplification cone, called an 'ear trumpet' was used as a hearing aid. A desk with a built-in amplifier into which a microphone and earphones could be plugged also was widely used, which worked better than passive ear trumpets though it was not portable. Today, the most common style of hearing aid used is a small electronic device that fits into the wearer's ear. It has a rectangular battery pack connected by a thin wire, which is held in a pocket. 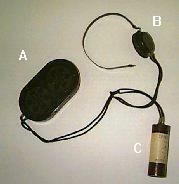 During late 20th century, hearing aids that were carried in pockets were replaced by a more sophisticated model in which small zinc-air batteries were placed in the inserted unit itself. Ear Trumpets: The earliest of hearing aids used were ear trumpets, which were skillfully carved from wood, precious metal (for use by nobles, rich merchants), seashells and animal horns. Wide at one end and narrowing to a small tip at the other, and swung around to be pointed in the right direction, the ear trumpet was used for ages in all cultures. Cow Horn Hearing Aid: There is an interesting story related to the invention of the cow horn hearing aid. One warrior snapped off a cow horn from his helmet, hollowing it and cutting off the tip, and then holding it to his ear, thus using it as an aid to receive orders during a battle. Hearing Aid Thrones: Special adapted thrones and chairs were designed to allow courtiers and other people to speak quietly while maintaining a distance from both hearing and deaf royals or kings. One would kneel before the throne and speak into openings in the arms of the chair. Inside this furniture was a tapering tube which sent the sound of the voices to a resonating chamber further up in the arms and the wings. The king could thus hear clearly without any unseemly shouting or unwanted closeness of the speaker. An excellent example of a hearing aid throne is Portugal's King Goa's throne made in 1819 by F.C. Rein & Son. The throne had armrests fashioned to resemble the heads of roaring lions. Supplicants would direct their voices into the mouth of a lion, and the hollow armrest would conduct the sound to an ear tube held by the king. These chairs were also carried along from one place to another wherever the king went. Clarvox Lorgnette Trumpet: It is a French invention that has twin features--spectacles with a light tortoiseshell ear trumpet. The trumpet was usually made of dark material of tortoiseshell and it was hung down from one side of a pair of spectacles in the hope that it could be disguised against the user's dark clothing. Opera Domes or London Domes: This type of hearing aid was invented in the 1850s in England. 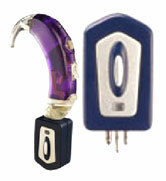 Made of thin metal and available in a variety of sizes depending on hearing loss, it soon became very popular. It is also called an opera dome because it could be used by hearing fans of the opera to improve the sound quality of a performance. Acoustic Table Urn: The acoustic table urn is one of the strangest of hearing aid inventions. The urn, with its multiple decorated openings, was meant to capture sound from any angle in the room. The interior resonator would then channel sound directly to the user through a long ear tube, which could be disguised as part of a table runner. It was the fashion to fill the urn with fruits or flowers, thereby dulling its resonating effect. Ear Tube: The invention of the ear tube allowed the user to get sound straight from the source. The speaker held one end of the tube to his mouth, while the user placed the other over the ear. Stethoclare: Measuring only 11 cm in diameter the stethoclare an advanced model of the acoustic urn, proved much easier to carry. The user placed the Stethoclare sound-catcher on a table, and ran a tube from it to the ear. Desktop Hearing Aid: This is the first electric hearing aid, which were available in the market around 1901. But these desktop hearing aids were very large and impractical. The 1930 version of the same model, available at $400 with smaller sizes employed carbon-dust microphones. The desktop devices used were a carbon microphone, processing unit, battery box and, and headpiece. Batteries often did not last more than a few hours. Carbon Microphone Aids: Advances in microphone and battery technology facilitated the development of smaller and handy microphone models that are connected to batteries carried in special cases. The microphone was worn around the neck and was connected to the earpiece by wires. Vacuum Tube Model: The vacuum tube model was invented in the 1940s which are connected to large batteries, but they were easier to use. It turned out to be a better delivery tool for the gathered sound in a hearing aid. Oticon Pocket Model: This hearing aid allowed the user to improve hearing without standing out in a crowd. The small battery and processing component fit easily into a pocket, or under the user's clothes. Beltone's 'Slimmette': The invention of the Beltone's 'Slimmette' saw the development of smaller models of hearing aids that could be concealed easily. This style concealed the hearing aids in flaps that would hang over the ear from the wearer's eyeglasses. Over-the-Ear Hearing Aids: Hearing aid models models were developed to fit the wearer with custom-made ear tubes. These were easy to conceal behind the ear or under the hair. It is an 'all in one' unit that combined the battery, microphone and transistor circuit in an all in one molded design with a small individually built ear tube. In-the-Canal (ITC) Hearing Aids: In the 1970s, one of the most easily usable hearing aids--'in-the-canal' was developed where batteries used were even smaller, allowing the ITC, aids to fill the ear canal without anything worn outside the ear. In-the-Ear-Canal (IETC) Hearing Aids: By the late 1980's advanced circuitry and lithium batteries made possible a unit that could be concealed completely in the ear canal. Termed as "In-the-Ear-Canal", these tiny devices, which can be dropped in the ear and totally hidden from view, became very popular in the market. Digital Processing Hearing Aids: With the advent of Digital Signal Processing (DSP), the hearing aid turned into a mini-computer. Digital processing hearing aids allow even greater clarity and users can program their hearing aids to access the most useful range of tonality. 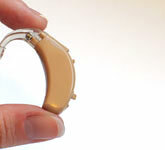 Today's Hearing Aids: Gradually, two channel sound, automatic volume control or remote volume control for the smallest of ITC instruments that are totally invisible were developed. Then fully digital audio processors were developed that global research took up to produce a working system they named Adaptive Speech Alignment, which boasts multi-tone banding and dual processing, one each for recognizing vowels and consonants. Today's hearing aids have super advanced feedback controls, more self-assessment of listening comfort and memory cards for the remote control. Models of micro-magnets implanted next to the eardrum, which will never need replacing will soon be available in the market. Hearing aids differ in in size, power and circuitry, all available in different sizes and models at varied prices. Wireless hearing aids mark the hearing aid technology today. One hearing aid can transmit to the other side so that pressing one aid's program button simultaneously changes the other aid and both aids change background settings simultaneously. FM listening systems are connected to wireless receivers integrated with the use of hearing aids. A separate wireless microphone can be given to a partner from a short distance or even in another room to wear. The voice is transmitted wirelessly to the hearing aids reducing the effects of distance and background noise. Many theatres and lecture halls today are equipped with listening systems that transmit the sound directly from the stage to the the audience. Digital Programmable Hearing Aids: This self-adjusting hearing aid technology has all the features of analog programmable aids but use "digitized sound processing" to convert sound waves into digital signals. The computer chip employed in the aid analyzes the signals of one'sr environment to determine if the sound is noise or speech and then makes modifications to provide a clear, amplified distortion-free signal. Are there any medical considerations or corrections for hearing loss? Which type is best for hearing loss? What is the cost of the hearing aid? What fees are nonrefundable if they are returned after the trial period?